Steroids – one year on! Exactly one year ago today, Luke’s consultant made the decision that the time was right to start Luke on steroids. There would be tests etc to do first but the decision was made and steroids would become part of our lives in just a couple of months. I’ll admit, I didn’t take it very well and it would be months before I would fully accept it. I thought we would have had at least another year to prepare for this next stage of our Duchenne journey and to keep Luke’s little body free of drugs that had the potential to do more harm than good. But Luke hadn’t really gotten any stronger since his last appointment and research does show that ‘if’ steroids were effective for a child with Duchenne then the younger they were started the better. So why the big deal? Excessive weight gain – This is one of the more widely known side effects of long term steroid use and causes enormous pressure on the child’s bones, heart and lungs which are already weakened. Indeed the reasons not to start steroids go more deeply than this but these are the reasons I was so afraid to start steroids. But steroids create the ‘possibility’ that Luke will walk for up to 2 years longer than expected, they make it possible that he ‘may’ escape the need for scoliosis surgery in his early teenage years, they give him energy that he would not otherwise have had, and in many cases steroid use is a pre requisite for participation on a clinical trial. And so Luke started to take steroids early this year on a 10 days off/ 10 days on regimen and so far, with the exception of some emotional and behavioural issues and him not having grown much since, they have had a positive impact on his life. He tires less easily, he can climb a little better, he can move a little quicker and his balance seems a little better. I can’t see what they are doing inside his body but for now, his regime has kept many of the physical side effects at bay. He will move to a daily regime within the coming months and I know that this will change things. But for now, the decision to start steroids was a positive one and we will focus on that and the hope that they might keep him walking for longer and use all of Luke’s newly acquired skills to make his life as happy and abundant as possible while they last :-). I came across a video of Luke’s first steps at the weekend and it made me smile. It brought back all those happy memories that all mummies have of seeing their first born child take their first tentative steps in the world. I remember those clumsy little footsteps and the countless falls. The pitter patter of his feet on the floor is a sound I hope never to forget and one that still makes my heart reasound happiness. I remember the first time he came walking out of the bed room on his own, the first time he walked without holding my hand, the first time he climbed a step. It got me thinking about how precious each and every footstep is for a child with Duchenne and indeed any illness where that ability will be lost. 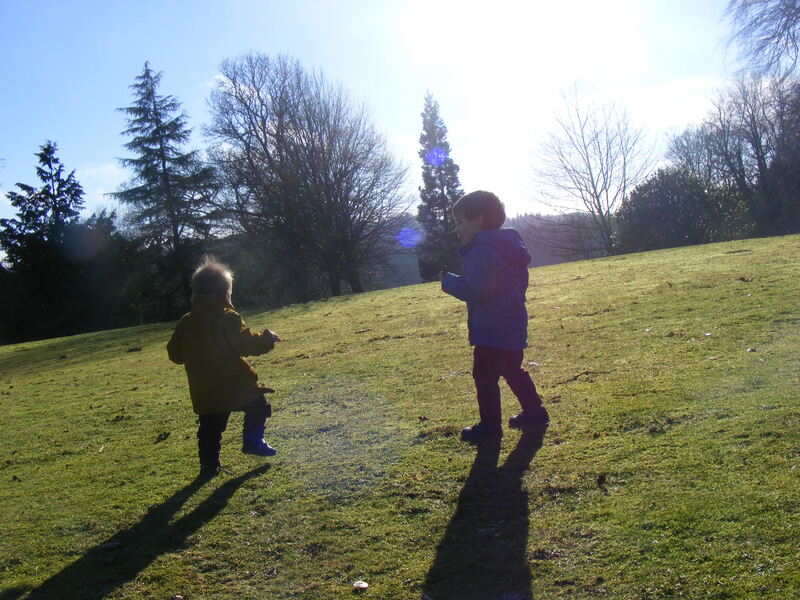 Most children take their first clumsy little steps then go on to become more confident, developing their balance and co ordination and eventually learning to run, though some like Luke’s little brother Coen try to learn to run before they can walk. Luke can walk independently now, just a little slower than other kids his age but I know that I should treasure every minute where I can watch him on his feet because Luke’s walk will never be any stronger or faster than it is right now. He will never run like other kids his age. Instead of his muscles getting stronger they will waste away on him. Every step is a delight to watch but is also a step closer to being his last. 1). Independence – Since Luke started primary school just over a month ago we have been amazed at his desire to be independent. He’s so determined to do everything himself now that he’s a ‘big boy’. Just last week he waddled the 150 yards or so from his granny’s house to ours. It took ages but when we got to our gate he shouted ‘I ran all the way to our house’ in a voice that resounded such pride and happiness with himself that my heart couldn’t help but smile and sink all at the same time. As with any 4 year old, that desire to be independent is one that I feed. I encourage him to do his own thing, to go to the toilet himself, to climb into bed himself, to walk to the car in the morning himself. How then, I wonder, will he cope when that independence is taken from him by Duchenne? 2). Happiness – I take great pride in the fact that Luke is a happy little boy. He is always smiling, probably because he’s always up to devilment lol, but he has a smile and a laugh so infectious you can’t help but be drawn in by him. Luke is happiest when he is outside investigating and playing. He loves going out for walks to the park, to the shop, to Granny’s house. Just this morning he said he wanted to walk to school (some chance considering the school is over 3 miles away and we were already running late). While he has his independence I can continue to make him happy by doing all the things he loves. But what happens when he is no longer physically able to do all those things? When he can’t do what his friends are doing because it’s not an accessible activity? How do I continue to feed his happiness? 3) Health – The most important one and the one I left until last because it’s the one that scares me the most. It is well known that the life expectancy of a child with Duchenne correlates directly with the age at which they go off their feet full time. That means that if I want to try to improve life expectancy for Luke I have to keep him walking as long as possible, but in reality who really knows how to do that without some form of medical miracle? Once Luke goes off his feet his condition will deteriorate more rapidly, eating away at the muscles in his upper body and if he loses the ability to walk before the adolescent growth spurt, the likelihood is he will develop severe scoliosis (curvature of the spine). Unfortunately I know first-hand the implications of scoliosis and spinal fusion surgery for a child with Duchenne. My brother Mark, who had Duchenne, went off his feet permanently when he was 9 years old and as commonly happens, he developed scoliosis, and needed surgery to try to help straighten the curve and relieve pressure on internal organs. Mark went for his scoliosis op on a Monday at the Royal Belfast Hospital for Sick Children. He was in theatre for well over 6 hours and then was moved straight to his own ward in Intensive Care. I wasn’t allowed in but the week before, they had given all of us a tour of the hospital and told us what to expect and even showed us the room Mark would be in within the ICU. Mark was nervous about his operation – well who wouldn’t be – he was 12 years old and doctors were about to put a rod down the length of his spine – but he was excited – he knew he would be spoiled while he was in hospital and he knew he would be much more comfortable in his chair when he came out the other side of the op. BUT it was not to be. By the Wednesday it was evident that something was wrong. Mum was with Mark at the time and I won’t tell you how quickly my Dad got the 40 miles to the hospital but let’s just say some speeding laws were drastically broken that day as Daddy rushed to be with his wife and only son as they waited to hear what was wrong. It turned out that something had gone wrong in the operation, Mark would be paralysed from the waist down and the operation had to be undone. It was all for nothing. Mark would spend the next month in hospital and the next 2 months constantly in a cast designed to try to hold him up straight. The cast would become a permanent part of Mark’s life. 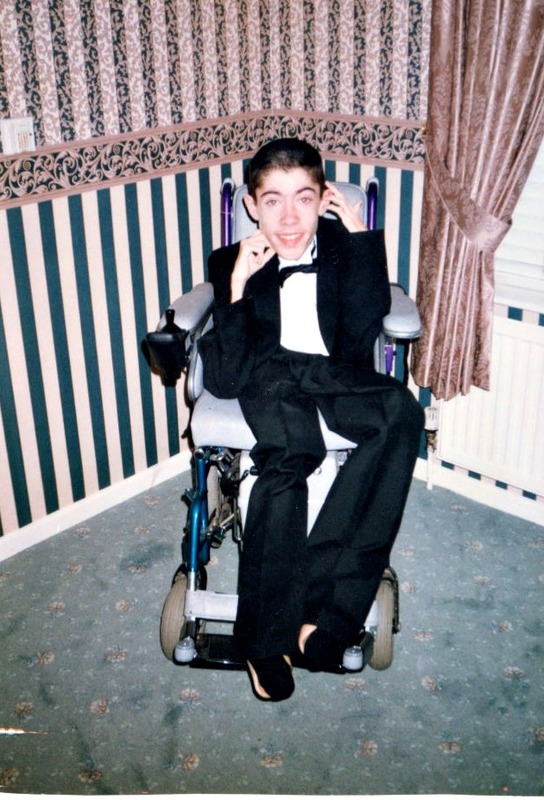 Thankfully Mark gained back the feeling in his lower half but four years and 8 months after his operation Mark lost his battle to Duchenne due to respiratory failure. Those who knew Mark may remember him always slouched to one side. That inevitably put great pressure on already weakening lungs. I can’t help but wonder if his operation had worked would we have had Mark for longer? If he had walked for a few more years instead of being wheelchair bound at 9 would scoliosis have been delayed or even avoided, giving us more time with him? So many questions! None that we will ever really know the answers to. 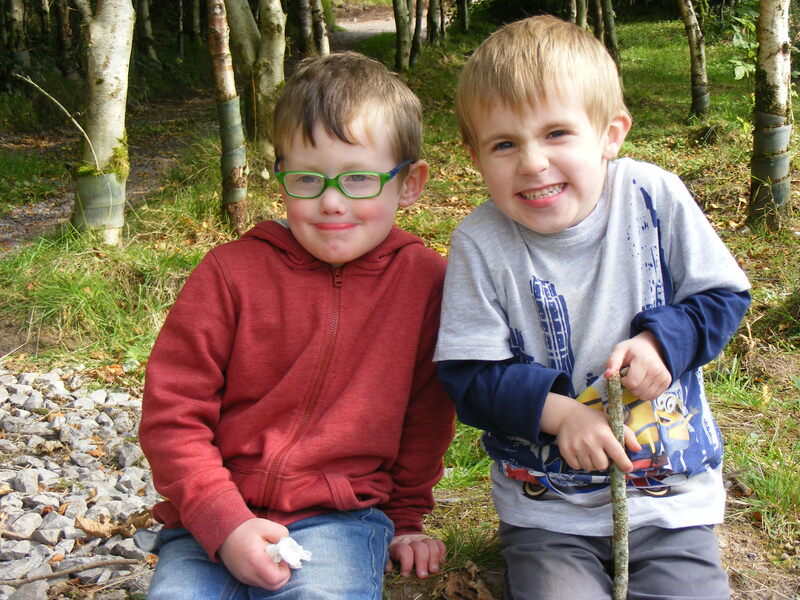 But the quest for answers will lead us to doing all we can to make sure that Luke and his cousin Brian Og walk for longer, keep their independence for longer, remain happy little boys who grow into happy fulfilled young men and who ultimately will grow up and achieve all they wish to despite Duchenne. Please help us put meaning in every footstep. Share our story, create awareness with us and help us beat Duchenne once and for all.